The persistent question that will not go away is, “Why has there been no church planting movement in the West,” when these movements have been prospering everywhere else around the globe. One answer is that a church planting movement is just one part of Rapid Kingdom Expansion in the West. I have been making the case that Rapid Kingdom Expansion involves three things in the West: a church planting movement, a Christian Households movement, and a media presence that makes the case that faith, faithfulness, hospitality and encouragement are important human values. But there is another danger lurking for the Western church that can prevent a church planting movement from happening and that is an insufficient trust in the Holy Spirit to be able to expand the Kingdom in our culture. 1. That the Holy Spirit can transform a person in a moment after hearing a simple Gospel presentation, and that there are many people out there whom the Holy Spirit has ready and are waiting for that moment. I believe that a church planting movement works by finding those people who are “ready for the harvest” or ready to be “Snatched from the fire” (Jude 23). I do not know how large this segment of the population is, but there must be many. Jesus talked about whole fields being ready to be harvested. 2. That new Christians can share their faith, gather a group, disciple that group, and then send that group out to plant seeds of the Gospel. Of course, the reason they can do this is that they have been discipled and that discipleship includes training in the specific behaviors that they need to complete for the Kingdom to grow. They have been trained how to share their story and God’s story in a simple way, and they have been trained how to walk people through a discipleship lesson that someone had previously walked them through. 3. That we can disciple people in a way the produces not just knowledge but actions. Having a goal of meeting together to produce knowledge is so much safer than meeting together to produce behaviors. There is a much higher risk of failure if our goal is to get someone to act in a specific way. If we train someone for knowledge and nothing changes, we can still feel as if we have succeeded. If we train someone for action and nothing changes, then we have to examine whether or not we are doing the right things in our training. The Holy Spirit is ready to assist us in discipling people in a way that produces the actions necessary to go into new fields, sow the Gospel, lead people to Christ, disciple those people and gather them into a new church. We should take the full assistance of the Holy Spirit in our work. 4. That the Holy Spirit can form a church out of a small group of newly discipled believers. Jesus said that wherever two or three are gathered in his name, he is there with them (Mt. 18:20). He is present through his Holy Spirit who is working in that group of people to accomplish the plans of God for each person and for the world. Almost every church has started with a very small group of people. Whether it is a vision of one person who shares that vision with a few others, or a small group that gathers and begins to grow, all churches begin by the faith of a few. We need greater trust that the Holy Spirit will work in our groups to shape us into churches. We are part of a small network of churches with a big vision. Historically we are the Free Methodist Churches in the Wilkes Barre District of the Acts 12:24 Churches of the Free Methodist Church, USA. But we can dispense with the long title. By the call of God, we are simply the Acts 11:12 Team. Just like Peter said in Acts 11:12, “The Spirit told me to have no hesitation about going…”, so we are being prompted by the Spirit to go without hesitation. We believe that we are to go without hesitation to place a new group or church with the spiritual DNA of multiplication in every town and city in a 17 county region of Pennsylvania. Saying “yes” to this call of God drives us to our knees in prayer. The Acts 11:12 Team (Wilkes Barre District) is uniting in a call to prayer. In February and March 2014 we are asking our pastors to call their churches to pray for God’s Kingdom to expand rapidly. We have provided a Prayer Guide and a PowerPoint presentation (set up as a loop for pre-service showing, but it is also able to be used as announcement slides or a sermon presentation). The prayer has already begun in some places. So, already, glimmers of the supernatural power of the Holy Spirit are shining into our churches as the prayer is increasing. Or I think of two men who went on a Luke 10 Journey to the Pennsylvania Farm Show not long ago. After hours spent talking with people, they encountered two individuals from Upper Dauphin County who were spiritually receptive. Not long before, one of these brothers had driven through Upper Dauphin County and asked God to open this area to the Acts 11:12 Team. Here’s what I know, the more prayer that is invested in the Focus 17 Initiative, the more God is connecting us with spiritually open people. So, I’m asking you today to call your church to prayer. Share the attached bulletin insert on a couple consecutive Sundays. We’re providing it to you in two formats – a PDF version and a Word doc that you can edit if you want to personalize it to your ministry before printing it. Be aware, though, that Word docs can lose their original format if you have a different software version or if you don’t have the same fonts that our Administrative Assistant, Shari Turner, has on her computer. We have also attached the PowerPoint file that coordinates with the bulletin insert. If you would like to have the bulletin insert mailed to you as a hard copy, please e-mail Shari at growinggodskingdom@gmail.com. She will be happy to send this to you. This communication is being sent to everyone on our Wilkes Barre District regular e-mail list. We are specifically asking pastors of the District to take action with it. For everyone else who receives our regular “all-interested” e-mails, we would love to have you connect with this prayer mobilization, as well. And finally, we are sending this e-mail to more than 25 partners who told us at our Focus 17 Banquet in October that you would be part of our Focus 17 Prayer Team. Please speak with your pastor to see if you can assist in the prayer mobilization at your church. We will train disciples to be disciple makers. We will send Luke 10 Teams on journeys, each journey supported by prayer warriors each praying at breakthrough levels; to new places (neighborhoods, towns, cities, etc); finding persons of peace; and starting new groups/churches. Pray that the Acts 11:12 team will be prompted by the Holy Spirit. Pray that Acts 11:12 Team will be bold to go out and speak the word of Jesus. Carbon, Columbia, Cumberland, Dauphin, Lackawanna, Lebanon, Lehigh, Luzerne, Monroe, Montour, Northumberland, Perry, Schuylkill, Susquehanna, Wayne, Wyoming, York. Pray that Acts 11:12 Team members will tell their story (personal testimony) and tell God’s story (plan of salvation) today. Pray for God to prompt teams of two to go into new cities, towns or neighborhoods this week. Pray that the Holy Spirit will supernaturally prepare people’s hearts to respond to the word of God. Pray that Luke 10 Teams will meet persons of peace – individuals who are spiritually open – who will invite the team to speak of the Kingdom of God to an entire relationship group. Pray for God’s healing power to accompany Luke 10 Teams as they proclaim the Kingdom of God to a group of people. Pray for new believers and entire households to be baptized. Pray for believers to enter discipleship training and to immediately begin discipling others. ____ I will take this Focus 17 Prayer Guide and pray through it once a week during the Call to Prayer (February/March 2014). When Jesus sent out his disciples two by two to find persons of peace, he gave them specific instructions. Some of these instructions were: they were to go to the towns where Jesus wanted to work, they were to go needy (do not take money), and they were to find the person of peace that had been prepared to hear the message of the Gospel. The reason for these instructions is clear; to succeed in the task that they had been given they had to learn to depend on God for their success. They had to discover the town, find a person of peace, and allow that person of peace to meet their needs. All of these require the supernatural intervention of God in human plans. Starting a church planting movement is not something that is under the control of believers; it requires the work of the Holy Spirit in the world. While starting a church planting movement requires specific behaviors from believers (i.e. entry strategies, Gospel strategies, discipleship strategies, church formation strategies), these behaviors are not enough to succeed. Unless the Holy Spirit is directing us where he wants us to go, bringing the person of peace into our path, and preparing the person of peace to hear the Gospel, we cannot start a church planting movement. 1. The Holy Spirit makes possible our confession of Christ in the world. 2. The Holy Spirit stirs and calls people to the work of multiplication. 3. The Holy Spirit calls and convicts the person of peace and their family and friends. 4. The Holy assists in bringing people to saving faith in Christ. 5. The Holy Spirit heals the family members of the person of peace. 6. The Holy Spirit gathers the right group of people together for training who will become the nucleus of a new congregation. 7. The Holy Spirit empowers the trainers of the new group. 8. The Holy Spirit forms a group into a church. 9. The Holy Spirit raises up leaders for the church. 10. The Holy Spirit raises up those who can start new groups, and those who can train new multipliers from the members of the new church. A church planting movement is a supernatural process. Only those people who learn to move in the supernatural realm by becoming dependent on the Holy Spirit’s work in the world can succeed at this work. In the last twelve months we have been able to initiate 9,000 new churches bringing to total some 30,875 new VCP Churches with over three million members. This Christmas 1,3 million new VCP members will celebrate Christmas for the first time. You are part of this exciting Kingdom history. We are teaching the churches to be socially responsible and to be mindful to Christ’s command to look after widows and orphans. Today our church registries reflect 59,144 widows and 79,555 orphans. The VCP churches across Africa take the lead in providing for the bereaved and destitute in their communities. Never-the-less they need help. We continue to see the Lord’s hand on the Into Africa minis-tries. Our September 2013 registry records 30,875 churches, with membership at 3,066,360. The persistence and faithfulness of our Supervisors, Coordinators, Trainers, Pastors, and Denominational partners bear testimony to the faith and grace of our heavenly Father. Jesus, with an eye of faith, saw beyond the status quo , He saw His Father’s future, His Harvest Field. He mobilized his disciples to pray, not to the Lord of the status quo, but to the Lord of the impending Harvest. 3) Train Shepherds/Pastors to reap His Harvest. We cannot underestimate the intentionality of preparing Shepherds for Shepherdless Sheep to facilitate a Church Planting Movement. Jesus was doing this as He spoke these words to His disciples. The result was the Church Planting movement recorded in Acts. If we faithfully anticipate the Harvest & pre-pare Shepherds we will see His Harvest in our days!!! “If you abide in me, and my words abide in you, ask whatever you wish and it will be given you.” John 15:7. “This key text, makes it plain that the promise is unlimited, but its fulfillment depends on the abiding. That is why in all cases of intercession, Mr. Howells constantly spoke of ‘guarding his place of abiding.’” (From, “Rees Howells Intercessor” p. 64). In Steven Covey’s book, “Seven Habits of Highly Successful People,” he lists “Beginning with the end in mind” as one of those habits that lead to success. To have a church planting movement we have to start our work in an empty field with a clear end in mind – that of seeing a healthy church established in that community. With all the work we do to teach people the basic strategies of a church planting movement, i.e. Entry strategies for empty fields (finding a person of peace); Gospel Strategies for seeded fields; Discipleship strategies for growing fields; and Harvest strategies for fields ready to be harvested, it is easy to lose sight of the fact that what we are trying to produce is a church planting movement. The goal or our work is to populate our region with new churches that reach people for Jesus, disciple them in the faith, and send them out to reach more people and start new churches. Simply put, the goal of all of our work is produce new churches. It is important that we do not let our success in the early strategies, such as finding a person of peace or forming a new discipleship group, distract us from the end goal which is to produce a new church in a new community. To keep church planting in the forefront of our work, we have to keep asking God to give us a vision of new churches in new communities. We have done some good work in sending people out to find persons of peace, and getting people into short-term discipleship, but it is important that we take the next step and assist these groups to become churches. 1. Plan for multiple plants at once. Pray over a map and determine communities for first and second generation churches. Bruce Bennett is quite clear that we should map both first and second generation churches at the beginning of our work. Planning for multiple generation churches helps us to keep our eye on the goal of planting a new church. 2. Be clear with people that we reach from the very beginning of our interaction that we are trying to plant a church. It is important that we fully disclose to people that our goal is to start a church in their community. We do not want to start a discipleship group of new believers and inform them after being well into the process that we are really trying to start a church. People want us to be up front about our intentions from the beginning. 3. Plan your discipleship meetings so that they can become church services. T4T teaches that there are three parts to a successful meeting. (See the article below on “What to Include in the Weekly Meeting”.) Every discipleship group that we start is an infant church. If you incorporate these three parts to the meeting from the first meeting, your group will have an easy time morphing their weekly meeting into regular church services. Last summer a group of pastors attended Strategy Coordinator Training taught by Superintendent Harvey. This group has continued to “meet and report” on their work through e-mail and video conference. Below is Joel Guzman’s report to this group regarding his Mt. Bethel Project work. Since September to date, I have placed 43 of the T4T books in Spanish into the hands of interested pastors & laypersons. I have advertised it as the practical nuts & bolts of CCP & the ABCs of a CPM. Last Saturday, I went to Reading, PA & gave a CCP training to a key family in the CP there led by Jose Medina, along with a new family I introduced to our people there & left them with 2 T4T books. Last Friday, I met with the two pastors who live in Manhattan & have recently begun a new FM CP in Manhattan, Roberto Castro & Javier Veras & made sure they have & are reading T4T. I will be going to their service this Sunday from 5pm -7pm & preaching there. They have 6 home locations in Manhattan where they are training new believers. Locally, T4T & CCP has activated the 20% in our Church who are the doers & the other 80% who are interested. This has resulted in 65 conversions to date this year. Next Friday we conclude 40 days of congregational fasting with a prayer vigil for revival and CCP. Tomorrow night I will be revealing the specific goals & plans received through prayer for Our CCPs in Bronx & Westchester counties to the students in our training Institute. We have been experiencing trials along the way but continue on for The Lord’s glory. Open with a brief prayer, asking for God’s guidance and blessing on your time together. 1. Pastoral care (10 minutes): Take time to listen to what God is doing in the life of each trainee and in their family. Encourage and pray for one another. 2. Worship (5 minutes): Sing a song or two of praise and worship. How did you obey last week’s lesson? With whom have your shared your story? With whom have you shared God’s plan of salvation? Who has believed? When are you training them to share their own story and to explain to others God’s plan of salvation? Are you teaching them the lessons? Are you training them to train others? (2 Timothy 2:2) Are they doing this? Are the people whom they are training training others? 5. New Lesson (30 minutes): Teach the trainees enough biblical content to obey and pass on this week. Your first six foundational lessons are provided. After the first six weeks, the trainees will engage in a weekly Bible study based on the pattern set forth in 2 Timothy 3:16-17. 6. Practice the Lesson (20 minutes): Instruct your trainees to divide into 2’s or 3’s and practice teaching the lesson to each other. 7. Set goals and pray (10 minutes): Direct your trainees to again ask God to show them to whom they will tell their story this week and whom they will train. Ask them to write down those names and pray for the Holy Spirit to prepare the way and work in the hearts of those on their lists. Important Hint: Do not allow any of the seven portions of the meeting to be omitted. Each portion reinforces the process of reproducing leaders and new believers. If you don’t have time for an hour and a half, stay with the three-part balance regardless; do not omit portions of the training cycle even if you have to shorten the lesson time. It has been mathematically calculated that if one person discipled another, and they in turn witnessed and discipled one each, and if this continued to multiply and each one hearing remained faithful to sharing with one other each week, it would take a short number of years for all 6.25 billion people in the world to be hear the gospel and to be saved. We must pray for the world, by praying as Jesus did, for God’s own people. The first time I heard Bruce Bennett teach about how to start a church planting movement (CPM) I was taken aback by his starting point. Bruce said that we start a CPM with a map. The way to start he said, was to get a map of our region, spread it out in front of us, and begin to pray about which towns and communities God wants us to go into to start a new church. Bruce said that we should mark on the map not just the communities where we are going to start first generation churches, but also the communities where we are going to start second generation churches. The core belief of CPM’s is that God is at work in the world through his Holy Spirit preparing people in communities to hear the Gospel and respond to it. These prepared people, “persons of peace” are the key to starting a church in the community. The Mt. Bethel Project has a good number of stories now of persons gathering to pray over a map and then going into a new community and talking to people that they do not know until a person of peace has been identified. We also have a number of stories of persons of peace who have been led to Christ and are now participating in short-term discipleship training. Storm Hutchinson is leading a church planting project in Schuylkill County, Pennsylvania. He has gathered a group that he is training to plant new churches in new communities. The people of his group have already found several persons of peace, led them to Christ, and have brought them into discipleship training groups. Storm and his original group began their CPM work by preparing a map of towns they believe Jesus is sending them into to find persons of peace. This first step has already been accomplished in several of these towns. 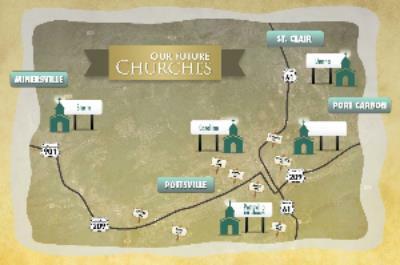 Here is Storm’s map of how they are visualizing towns where Jesus is sending them to in Schuylkill County. When you pray, pray for the work Storm is leading in Schuylkill County. Strategy Coordinators are those who have participated in the Mt. Bethel two day training in CPM strategies. During this training we review the basic strategies, examine various curriculum options for training others in these strategies, and participants have the opportunity to teach actual lessons. The goal of the training is to prepare people to gather and train a group of church planters who can implement the strategies to gather a group and train this group to become a second generation multiplying church. 1. Understanding the Harvest Fields & praying for the harvest. 4. Leading the Person of Peace through Salvation, if they say they are ready. We continuously review and practice each step at every meeting. One member of the group has taken her Person of Peace through to accepting Jesus as her Savior and began the lesson on Assurance of Salvation. We also have one person in New Jersey beginning the training with me as of October 21st (Euline). Each of the members has found their Person of peace and have shared their story and God’s story. They continue to fellowship with them and discuss and pray for their issues. As a group we continue to pray for each other and the person’s Person of Peace. Dan has gathered two groups in his church and has been using CPM material to train them to participate in the Billy Graham “My Hope America” Campaign. Dan has been teaching his people the CPM “Seeded Field” strategy of sharing the Gospel by “telling my story, telling God’s story.” CPM’s work hard at teaching people to tell their story in no more than three minutes. This includes: my life before Christ, how I met Christ, and my life after Christ.” After sharing their story then they share God’s story by sharing four scripture verses that point people toward an opportunity to accept Christ. Please continue to pray for Tom. He is pastoring a church, working as a superintendent of the North Michigan conference, and has been going into different towns trying to start a CPM in his region. We are working hard at the church planting. As I have strength I am working with a couple in Cadillac to get something going there and we have church planting project started in Mecosta. I am looking for partners, (persons of peace) in Clare and Reed city. This issue of the Mt. Bethel Update will be devoted to the Superintendent’s David Harvey’s report to the District Leaders of Acts 12:24 Churches. When the Mt. Bethel Project was set up, the district leaders were designated as the board of Mt. Bethel and David Harvey was designated the interim leader of the project. This report is a summary of what has been done through the Mt. Bethel project to date. It has been about 14 months since the Mt Bethel project was authorized by the annual conference and oversight of the project delegated to the district leaders. Here is a brief summary of what has been done in those fourteen months and a summary of where the project is currently, and suggestions for moving forward. We began the project by spending several months trying to understand the Bruce Bennett system better. We reviewed it at several district leaders meetings and had a couple of conference phone calls seeking to understand this better. Several churches across the conference began to seek to implement some of the teachings they had learned at Reframe Conference. Late in the Fall of 2013 representatives from about six or seven churches met together at Waverly, PA to compare notes about what things they were trying and how they were succeeding. Most efforts reported were classes in which Bruce’s material was being taught and/or people going into new communities looking for a person of peace. The superintendent has been trying to put the church planting movement teachings in a format that is easily understood by people who hear these teachings. I spent the entire three months of my sabbatical reading everything I could find on successful church planting movements (CPM’s). I have done several seminars presenting the CPM system including one in Michigan which about 100 people attended, one at Passaic Spanish for the Spanish churches which about 65 people attended. I have also met about four times with small groups, either in a local church or a combination of people from different churches to talk about the CPM system. Recently we had our first Strategy Coordinator Training seminar in which ten people participated. In addition, I have been producing the Mt. Bethel Update which is distributed to about 200 people by email. – Baltimore Spanish – Pastor Fernando Gonzalez attended Strategy Coordinator Training and is starting a church planter training class. Pastor Fernando has plans to teach this strategy to his other three church plants. – Bronx Spanish, El Remenente – Pastor Joel Guzman has translated the entire Bruce Bennett system into Spanish and has trained a class of twenty people. A number of members of this class have gone into neighborhoods in the Bronx looking for a person of peace. Three new church plant groups have been started and are being led by lay members who went through his class. Joel is also translating the Omega church planting course and the Bruce Bennett pastoral training course and using these to train his leaders. Pastor Joel has also attended the Strategy Coordinator training and has translated some of the T4T materials so that Spanish pastors can use them. Joel also planned and coordinated the Hispanic CPM training event at Passaic First Spanish in which about 65 people participated. – Brooklyn First – Assistant pastor Euline Jackson went through Strategy Coordinator Training and has started a group with five people she is training to plant a church. Three of these class members are from Brooklyn and two are from New Jersey. – Buck Township – Pastor Joe Gandia has been to Wilkes-Barre looking for a person of peace. Joe has identified a person and has now started a group in Wilkes-Barre. The group is meeting weekly. – Clifton Crossroads – Pastor Willie Kirchhofer has started a new group in a community and is preparing a lay person to lead the group. Pastor Willie is also working to start a group in New York City. – Clifton, Casa de Oracion – led by Pastor Camilo Mora and Myller Olivio, this church has started three new church planting groups in the past year and is training lay persons to pastor these groups. Pastor Myller also attended Strategy Coordinator training and is new starting a new group to train to plant churches. – Fort Washington, Bethel – Pastor Dan Norheim attended Strategy Coordinator training and is starting a small group to train as church planters. – Layhill, Silver Springs, MD – Focusing on Bruce Bennett’s Mobilizing Members in the Fall both in preaching and creating groups to train people to create groups. – Mechanicsburg, Good News – Pastor Al Sones has committed to going out and finding persons of peace. Al has done this about five times and has taken other people with him each time to teach them how to do it. Al has identified several persons of peace through this work. Al is also teaching a course in his local church that is designed to produce church planters. Al is leading the Wilkes-Barre district in a church multiplication program. See the information below under Wilkes-Barre District. – Nescopeck, Living Hope – Pastor Mike Maleski has attended Strategy Coordinator training and is starting a group for church planter training. A lay person from Living Hope also attended Strategy Coordinator training. This lay person has started a new group in Shamokin, PA.
– Orange Spanish – Pastor Efrain Reyes attended the Hispanic training event held at Passaic Spanish Church. He videotaped the event and has begun showing the video to his church. He is preparing to teach a church planters class. – Outlet – Pastor Matt Riley has been involved in the new group in Wilkes- Barre started by Joe Gandia. Matt has worked to reach several unchurched families in Wilkes-Barre. – Passaic, First Spanish – This church hosted the Hispanic CPM training event. Pastor Hector Fernandez has about 70 people in pastoral training and is trying to understand how to incorporate the CPM training as part of his pastoral training. He has invited Joel Guzman to come and teach his pastor’s training class in the principles of church multiplication. – Plymouth Meeting, Storehouse – Pastor JR Rushik has had a pastors training class for several years now and is seeking to incorporate the CPM teachings into this class. He has several people ready to start a new church plant. – Pottsville, PA CPP – Led by pastor Storm Hutchison this new church has developed a church planting strategy that has identified the next four communities in which they will plant, and the person who will be leading this church plant. Pastor Storm has been teaching and preparing these four new pastors. In addition they have identified eight communities they are targeting for second generation churches. It should be noted that one of the people in training to plant and pastor a new church is a person that was found by Pastor Storm and Al Sones going to a new community looking for a person of peace. – Wallenpaupack, PA – Pastor Ken Platt has identified a community in which he would like to start a new church and has done some preliminary work to identify a person of peace in that community. – Walton, NY, New Hope – Pastor Larry Light led a group of about 12 people through Bruce Bennett’s mobilizing members and they have gone out into nearby communities looking for persons of peace. They are continuing in their training and plans for starting new groups in new communities. – Waverly Community, PA – Pastor James Cohen and Al Sones have spent some time in the city of Scranton, PA, looking for a person of peace. – White Haven, Mountainview – Pastor Brooke Selby has been to the nearby community of Weatherly to look for a person of peace. He is working with a person who may be the person of peace. – The Wilkes-Barre District has developed a multiplication plan for the 17 counties of northeastern Pennsylvania called “Focus 17”. Each church in the district has committed to being part of this multiplication plan. The district is providing training and encouragement for their member churches to plant in targeted communities. The district is sponsoring a church planting banquet on October 29, 2013 to raise awareness and increase vision for church planting. – Church Multiplication Teams monthly meeting. This group arose out of the small cohort that met with Bruce Bennett at the last reframe meeting. The participants decided to get together monthly to report to each other on their progress and encourage each other. At the last meeting there were about 15 people present. This Group includes pastors from the Wilkes-Barre District, Storm Hutchison and his church planters, and Larry Light and people from his church planting group. – Pastor Ronnie Hampton – Pastor Hampton has been through the Mt. Bethel training and is moving to Shreveport, LA to plant a new church and implement the CPM plan. – North Michigan Conference – Superintendent Harvey led a “Church Planting by the Numbers” seminar for about 100 people in the North Michigan Conference. Several people have gone to new communities looking for a person of peace. I am increasingly convinced that one of the keys to starting this movement is to raise up a small group of people who have deep knowledge of how the system works, including the nine strategies and the behaviors we are trying to produce, and who also have the skills to train and oversee a group of people to go out and start their own group. At the end of the training each person shared their “to do” list for the next two weeks, and agreed to meet by conference phone call in two weeks to share how well they accomplished their “to do” list. – All six participants had either started a group or made arrangements and set dates to start a new group. Among the six there are eight groups either started or have dates set to start. The groups vary widely. One is a group for young men in their twenties. Another is an adult Sunday School class. – Of the groups that have already started, they have all started at the correct point of training people to tell their story and then go out and tell God’s story. We are praying in this current two weeks for conversions as these people go out. – One member of one group has already gathered two other people and started a second generation group. – One member of the group is working on developing a permanent “Christian Households” emphasis in his church that will carry over into the new groups that are being started. I am considering doing another Strategy Coordinator Training at a different location, perhaps Camp Timberledge, and I also need to develop Strategy Coordinator Training II which will focus on Strategies 6-9 which enable groups to become healthy, multiplying churches. What are the next steps for the Mt. Bethel Project? In addition to the work being done by the groups and individual churches listed above, the larger strategy to start a CPM is becoming clearer with each step we take. Listed below are some of the items that we have identified as important in the immediate future. Every CPM functions with a core of leaders trained to train others to be trainers. These trained leaders are called Strategy Coordinators. The superintendent has done the first Strategy Coordinator Training. The goal of SC training is to produce a cadre of people who are trained to train others, and will commit to being accountable to train others. We are teaching a system that has been widely used around the world to train people to train people who will train others. At the end of SC training participants that are called to this work commit to gather a group of about five people and train them to train others. During the training the SC’s are exposed proven training systems and agree to remain accountable to the superintendent and each other to produce new groups and train participants to train others. The goal is to continually produce new Strategy Coordinators to move the system forward. We will build a support system of coaching and encouragement for strategy coordinators and local church pastors and leaders involved in the work of church multiplication. At the beginning this work will be done by the superintendent (who has studied the system more than anyone else in our system) but over time we will be looking to identify and train coaches. To get to second, third, and fourth generation churches. Bruce Bennett believes that you have achieved multiplication when your system is producing fourth generation churches. Getting to second, third, and fourth generation churches will be the singular measure of success of the Mt. Bethel project. Since the goal of a CPM is to create thousands of churches, the means of training pastors becomes a critical part of the success of a movement. Bruce Bennett trains pastors for forty months. We need to develop our system of training that will provide many skilled pastors that will enable us have a successful CPM. CPM’s believe that the resources are in the harvest. The Mt. Bethel Project does not want to fund the planting of churches that arise out of its work. However, training and oversight will cost some money. We will get to a point in the near future where we will know the amount of funding it will take to get this project up and running in an efficient manner. 1. Fourth generation churches – This is the benchmark that we are seeking that will show that we have moved beyond addition and are reaching our goal of multiplication. 2. Regional Critical mass strategy – Movements always require critical mass to become a movement. It is possible that we should focus our efforts on one, two, or perhaps three geographical areas and seek critical mass in that area before we move on to other regions. 3. Christian Households – If there is one thing that I believe is restricting a church planting movement in the United States I would say that it is the nature of family life. Sociologists agree that something radically changed in family life in the 1960’s. Mary Eberstadt, in her book, “How the West Really Lost God” makes the case that the secularization of the United States that began in the 1960’s was caused by the decline of the family. According to Eberstadt the decline of the family was not caused by the decline of the church, but rather the decline of the church was caused by the decline of the family. Since the original church planting movement in the bible included both the home and the temple (Acts 20:20), and since the home is to be the primary place of creating reproducible disciples of Jesus, a focus on creating Christian households is essential to creating a church planting movement in the West. 4. Significant use of media/media strategy – A church planting movement requires acceptance and implementation of a specific set of values, including, hospitality, encouragement, faith, and faithfulness. For a movement to succeed these values have to become known and accepted in culture, at least among those we seek to reach. Today, values are transmitted broadly through media. There is a gaping hole in media today; these values are barely represented if at all. Even Christian media rarely promotes these values, and when it does, it does so in a way that appeals primarily to evangelical Christians and in a manner which can be quite off-putting to non-believer. We can create media that will gain credibility in culture for these values and this will assist a church planting movement. It is a need that is waiting for someone to come along and fill it. We are in a moment when persistence is required, we have had some success but the future is not yet clear to us. In these moments we must remember the words of Bruce Bennett that, “we may not have precedent, but we have promises.” We are trusting the promises of God as we move forward and seek to develop these fledging efforts into a church planting movement. “Encouragement is the ‘oil’ of the church.” This is one of Bruce Bennett’s favorite sayings. Without oil in an engine the friction produces heat and the heat will destroy the engine. Like oil keeps an engine functioning, encouragement keeps the church functioning. Starting a church planting movement requires creating reproducible systems of encouragement. The question of “how do we encourage the people we are training” is one that every trainer has to consider. Church planting movements are built on changing the behaviors of believers through the nine strategies. Behaviors are changed through training and encouragement. Encouragement happens both through face to face encouragement, but also through the weekly “meet and report” time that happens during the training meeting. During this time of the training meeting members of the training group report on the activities they have done during the past week to meet the goals they agreed to in the previous meeting. Those who have met their goals are appreciated and encouraged to keep going. Those who have not met their goals are appreciated and encouraged to do better. For example, if someone agrees to share their story and God’s story five times during the week, and at the report time during the next training week they report that they have only shared twice, then the goal of the trainer is to express appreciation for the good work they have done in sharing twice, and then encourage them to complete the next week’s assignment. “Meet and Report” is a powerful factor in shaping behavior of believers. If there is no “meet and report” time in the training session, trainees will quickly lose motivation to do the things that God is calling them to do, such as sharing their story and God’s story, or gathering their own group to train and disciple. This is a form of the old adage that “what get’s measured get’s done.” Just knowing that we are going to have to meet and report on our work toward our weekly goals is a great source of encouragement to keep meeting those goals. Eight people gathered at Peach orchard Retreat Center in August for the Mt. Bethel Project’s first Strategy Coordinator Training. The training consisted of three phases: a brief overview of the entire church planting system, an introduction to four different methods of short-term discipleship plans/plans to equip persons to share their faith and gather their own group, and opportunity to practice leading the actual lessons each trainer will be teaching their group. Strategy Coordinators play an important role in church planting movements. Strategy Coordinators are persons who understand the reproducible strategies necessary to have a movement and know how to train others in those strategies. The goal of training is always to produce reproducible behaviors in believers that they can pass on to the next generation of believers and churches. Our Strategy Coordinator training happened over two days during which the participants selected the system of training they will use with the groups they are starting. The participants also agreed to start their own group and train that group to share their faith, gather a group, disciple that group and train their group to train a second generation group. In addition to starting a group, the trainers in the group agreed to participate in a conference call every two weeks to “meet and report” on their progress. I want to thank each person that attended and also thank them for their obedience to God’s call on their life to participate in the work of church multiplication. The first Strategy Coordinator Training was a beneficial time for those who participated. We are considering doing this training a second time but in an area that would reach more people in the northern part of our conference. We are looking for eight to nine people who would be interested in attending this training. If you have interest in being part of this training please contact me at dharveymar@aol.com. Joel Guzman, who was one of the attendees at Strategy Coordinator training mentioned above, recently taught seventy-five Hispanic leaders the principles of starting a church planting movement. Present at this training were sixty-five small group leaders from Passaic First Spanish Church, pastored by Hector Fernandez, as well as ten leaders from Pastor Estaban Lora’s churches in Patterson, New Jersey and Brooklyn, New York. Pastor Hector is seeking to learn how some of his small groups can become church plants. With sixty-five small groups in many communities across northern New Jersey, pastor Hector has a vision to plant many Spanish churches. We want to continue to pray for Joel as he teaches these principles and coaches these pastors in the principles of church multiplication, and for the churches that God is calling to plant other churches. As you pray this week, pray especially for the first conversions to come out of the Mt. Bethel Project, and for second generation groups to emerge. There are about 125 involved in the Mt. Bethel Project in some way, but we have not yet had a large number of conversions. Please pray that God will bring to us the first large wave of conversions that will lead to the emergence of many second generation groups. “Discipleship Cycles” is a short paper that summarizes the entire church planting movement in 39 pages. It is the best short summary and short training document available. It is available to read free on the internet at http://www.scribd.com/doc/88649548/Discipleship-Cycles-T4T-Training-Material , but it is behind a pay wall if you wish to download it. “Discipleship Cycles” really describes one person’s implementation of T4T. One interesting aspect of the paper is that it talks about creating an ethos among the people you train. It is important that as part of our training program we create a mindset that promotes and enables implementation of our plans. Among the T4T church planting movements there is a distinctive ethos. This ethos has been used to guide their work and to give good reasons why this work of church planting should move forward. This ethos takes away the great barrier to church planting that exists in a lot of people’s minds that it is too complicated for them to attempt. Encourage your people that if God has called them he will enable them to complete their task with the simple system that tens of thousands of people have already used to plant a church. During Reframe Conference we had a small cohort group that met with Bruce Bennett for more directed training. One of the things that Bruce Bennett stressed is that finding a person of peace is often a process, involving several trips over a period of weeks or months into a community. In Mt. Bethel Update No. 13 we had the story of Al and Storm going to Boiling Springs, PA to identify a person of peace. Below is the story of Al’s follow-up visit to their contact in Boiling Springs. It’s also a fascinating experience to pray for my oikos with the belief that God is raising up many people from this household of faith to go into the harvest field (Focus 17/Mt. Bethel Project). (Note: Focus 17 is the Wilkes-Barre District’s initiative to plant churches in 17 counties in Northeastern PA.) I have this conviction that God is calling every one of these 234 to the Harvest – and Jesus specifically said to pray that the Lord of the Harvest will send workers into the Harvest. To take this hike, I drive to the small town where Storm and I went on our Luke 10 Day. As I was coming back down the mountain, I realized that it was time to follow-up with the man that Storm and I met on our Luke 10 Day. I went into his store. It was a very different dynamic from our Luke 10 Day – when the store had no-one else come in for the entire time we were there. The place was teeming with activity – many customers were there the entire time I was there today. This meant that I had only 10 interrupted minutes of conversation with the man we identified as a person of peace. Since I wasn’t sure he would remember me, when I walked up to him, I told him who I was. He remembered me as I introduced myself to him. He was somewhat reserved, but very friendly. He smiled a big smile when he realized that I had been one of the two men who visited him some months ago. I again told him that I had a strong sense that the call of God is on his life. He was warm and conversational for just about a four minute time period of the 10 minutes that we talked, before he had to deal with other customer’s walk up questions. He said that he just finished watching the “Left Behind” movies again. He said that he reads his Bible every day, which, he said, “Makes me nervous.” He explained that he reads different parts of the Bible which say to not do certain things and thinks, “I’ve done that.” He gets nervous because he believes he’s in trouble with God. He was chuckling (ruefully). I told him that he needs to get to the part about forgiveness, and he looked at me and nodded as he needed to walk away from me to deal with another issues. The conversation ended abruptly. He fully turned his attention to the next customer who walked up – without even acknowledging me as I said good bye. Now I don’t know if he has a hearing deficit, or if there was something else going on in his complete turn-away. I felt unsettled and disappointed by it. Now, I’ve reflected more today on what it means to have a Person of Peace invite you into his/her house. Clearly this man is a man with spiritual interest. But he has not invited me to anything more in his life at this point. When we first visited him he told me to expect that he might show up in church some day. He has not. He also gave me his e-mail address that first day, but did not acknowledge the two e-mails I sent to him shortly after our first visit. I find myself inclined to just go about my work in Boiling Springs, being sure that I cross paths with him whenever I can. I will take the teen group fishing in the lake right next to Rowland’s store – stopping in to the store while there. I also know that the daughter of the man of peace we found in Port Carbon knows this man from Boiling Spring. I don’t know what to make of that connection – happenstance? Divine conspiracy? Her father describes this woman as having been turned off to church by a past bad experience. I’ve met her. She presents in a forceful, opinionated way and makes sure that it’s clear that she has other stuff on her mind. That might be her defense mechanism. But when I talked with her and about the man from Boiling Spring, she lit up with a big smile. One of the goals of the Mt. Bethel Project is to develop a Christian Households movement alongside of our church planting movement. We are seeking to develop a simple set of strategies that will enable discipleship to be done primarily in the home in a way that is reproducible from one generation to another. We want children to grow up in Christian households and to reproduce that Christian household for their children. I am looking to gather a group of people who are called to help develop Christian household strategies. We will meet together both in person and by video conference to develop a simple set of strategies we can easily teach to parents. If you are interested in participating in this please contact David Harvey at dharveymar@aol.com.